This is why I appreciated receiving a press release from Buffalo Trace Distillery announcing the results of their most recent experiments to produce a perfect bourbon. 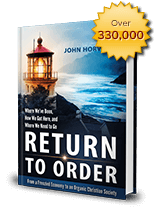 This entry was posted in Featured and tagged America, beautiful, brutal pace of life, Christian principles, economic crisis, Family, frenetic intemperance, moral values, Natural Law, Nobility of purpose, Order, organic Christian society, Return to Order, rule of money by John Horvat II. Bookmark the permalink.